Can you remember the name of how many capital of the country? You’ve come to the capital of the country and pick up where you have to yet? 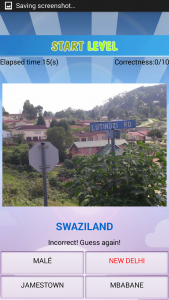 Funny capital quiz game with photo testing on the image name and the capital of the country and regions around the world. 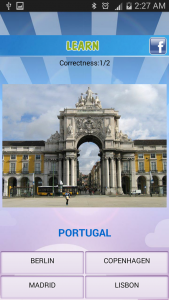 The game include learning and puzzle functions help you easily learn the name of the capital of the country and the region. The game also features striking images of all the country’s capital, thereby transmitting an additional piece of information about the economic and cultural characteristics of each country’s capital. 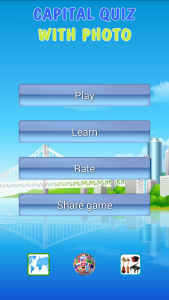 – The learning function help players learn and remember the name of the capital quickly. There are statistics to know the correct answer and the level of the player. – The quiz (play) divided into 5 levels with increasing number of questions, shorter response times to help players train memory, reflexes. The question multiple choice quiz format is fast. With each increasing level of difficulty playing the player will have to pass each level to higher level players. – Include the name of the capital of 238 countries and territories. Learning fun part is divided into five continents and the world. – The image quality of a country’s capital. We hope to receive feedback from users.